Last fall, Marshall’s legislation which included optometrists in the list of medical providers who may certify a handicapped plate or placard for a person with a disability was signed into law. The Distinguished Legislator Award is given to elected state legislators who work to champion the cause of optometry and vision care in Pennsylvania. The award ceremony was held in conjunction with POA’s Spring Congress at Seven Springs Mountain Resort in Seven Springs on May 18. “As the champion for House Bill 1288, Rep. Jim Marshall persevered in bringing the bill forward and making it a law that benefits the visually handicapped residents of the Commonwealth. The Pennsylvania Optometric Association is honored to award Rep. Marshall with the 2018 Distinguished Legislator Award for his dedication to our patients,” said Dr. Robert Bittel, chair of POA’s Legislative Affairs Committee. The Pennsylvania Optometric Association represents the interests of more than 1,250 doctors of optometry in Pennsylvania and works to advance eye and vision care for the citizens of the Commonwealth. 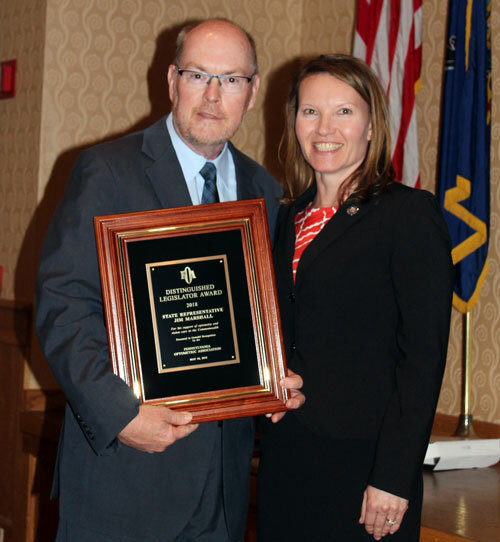 The Pennsylvania Optometric Association recently recognized Rep. Jim Marshall (R-Beaver/Butler) for his legislative contributions to the field of optometry by presenting him with the 2018 Distinguished Legislator Award. Marshall is pictured with POA President Dr. Rebecca Wincek-Bateson.